RMS-100 has 2 power relays for remote control of AC/DC powered equipment. RMS-100 has two power relays for remote control of AC/DC powered equipment. Each relay has a manual override button that can toggle the relay; useful for on-site testing. Each relay also has a jumper shunt connector that allows the relay to be engaged manually for hands free testing. 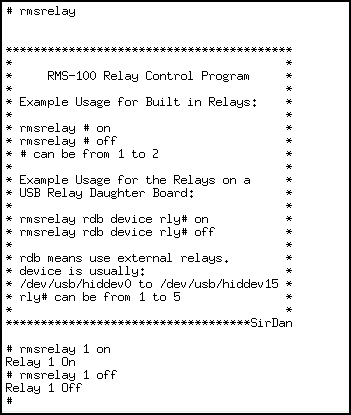 The relays can also be toggled with RMS-100 relay Scripts. 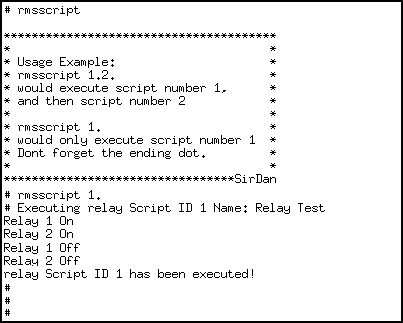 Relay scripts are made up of simple commands that control the relays. Complex relay actions can be performed to control your equipment. Control of the RMS-100 relays can also be done by using telnet or ssh. Below is an example of using the rmsrelay command to toggle relay 1 on and off. Below is an example of reading the status of Relay 1 using the command line interface. 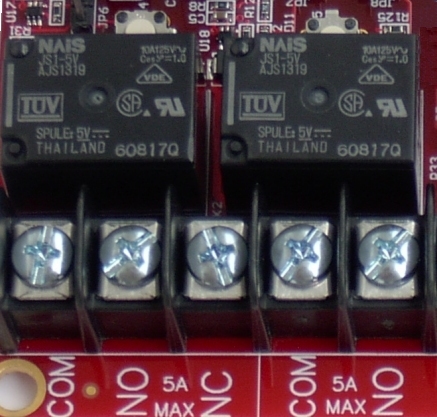 Note the relay1, and relay2 file will contain a "0" when the relay is in the "Normally Open" position, and will contain a "1" when in the "Normally Closed" position. The electrical ratings for the 6 position barrier strip can be found here.